Dalmatia is a region in the southeast of Europe. Though a small part is located in Montenegro, it mostly refers to the part in Croatia. Brač is famous for its precious white stone, which have been used in famous buildings like Diocletian's Palace and the White House in Washington, D.C.
Hvar offers beautiful beaches, lush vineyards, historic towns, a vibrant nightlife as well as a selection of activities from sea-kayaking to rock climbing. Krk is the largest island in the Adriatic and the most populous. It is readily accessed thanks to a bridge connecting it to the mainland. Korčula is claimed as the birthplace of Marco Polo and is the second most populated island. Home of 3 UNESCO intangible heritage treasures (Alka,Nijemo Kolo, Ojkanje singing[/i]), with many beautiful towns and unspoiled nature sites. Dalmatian hinterland is dominated by karst terrain through which three main rivers flow: Cetina, Krka and Zrmanja. Plitvice Lakes National Park consists of 16 stunning turquoise lakes connected by numerous waterfalls. Also on the UNESCO World Heritage List. Paklenica National Park is a river canyon in Starigrad, northern Dalmatia and a popular rock-climbing spot. Krka National Park is located in central Dalmatia and is popular for its numerous lakes and waterfalls. Historical Complex of Split with the Palace of Diocletian. The Cathedral of St. James in Šibenik. The Stari Grad Plain - island of Hvar. Carnival in Dubrovnik is also celebrated in February. Libertas Film Festival in Dubrovnik is an international film festival celebrating independent films. Dalmatia has a Mediterranean climate with warm, sunny and dry summers and mild but wetter winters. Temperatures range from around 10-15 °C during winter to around 30-32 °C in summer. Nights are around 5 °C and 15-20 °C respectively. Most of the rain (snow is rare around the coast, though can occur more inland) falls during the winterperiod. Dubrovnik Airport (DBV), Split Airport (SPU) and Zadar Airport (ZAD) are the main gateways. Check the Dubrovnik, Split and Zadar articles for more details. There are regular trains to/from Zagreb. From Ancona, there are crossing to Split, Zadar, Hvar and Vis. Check the Jadrolinija website for details. From Ancona and Pescara, crossings by ferry arrive in Split and Hvar respecitvely, but only during the summer months of June to September. Check Jadrolinija or SNAV for details. From Termoli, Larivera has ferries in the summer months of June to September to the Croatian towns of Korcula and Lastovo. SEM Maritime Company between Ancona and Split, seasonal between Ancona and both Hvar and Vis Island. Hydrofoil Miatrade between Ancona and both Bozava and Zadar. Jadrolinija is the main ferry company with connections between its many islands and coastal towns throughout Dalmatia, Istria and other areas. 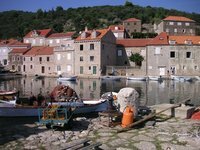 Split, Brac Island, Vis Island, Hvar Island, Korcula Island, Makarska, Mljet Island, Dubrovnik, Elaphiti Islands, Lastovo Island are some of the destinations. Other companies are Split tours for the area around Split (Hvar and Vis), Miatours for the area around Zadar and Medplov for connections between Orebic and Korcula. This is version 22. Last edited at 12:48 on May 3, 17 by Utrecht. 22 articles link to this page.